Fully equipped kitchen and laundry room. Wireless internet and HD cable. Elevator is next to covered parking area. On The widest part (Southern end of the Island)of the white sugar beach! Para-sailing, jet skiing, fishing, are all available on the beach. Everything is within walking distance, movie theater, stores, restaurants. Time square is approx. 3.5 miles by trolley or bike! This is a family themed island. A short drive, walk, or the Town Trolley, will take you to the public pier known as Time Square for shopping, restaurants and entertainment. Also available in this area is fishing off the 600' pier, or one can charter a boat and captain for a half or full day at sea. The 'Big-M' gambling boat departs from Fort Myers Beach. Buffet meals are available. There are over 65 golf courses all within an hours drive from the beach. Located just over the bridge to the south is Lover's Key, one of the most beautiful nature preserves in the state. Nearby, Fort Myers is host to the Thomas Edison Winter Home. Mr. Edison's home laboratory is just as he left it 75 years ago and directly across the street is the Henry Ford Estate. Both are available for touring. Also nearby, shopping, shopping, shopping! Coconut Point, Gulf Coast Town Center, Shops at Waterside, Edison Mall, Miromar and Tanger Outlet Malls. For the kids, Zoomers Amusement Park! And, did you know that Fort Myers is the spring training home for the Minnesota Twins (Lee County Sports Complex Hammond Stadium), Boston Red Sox (JetBlue Park), Tampa Bays Rays in Port Chalotte. To the north, beautiful Sanibel Island is just 25 minutes away - the 'Seashell Capital of the World'. To the south, Naples is nearby, where you may find the Naples Zoo as well as a beautiful downtown area for shopping and dining. Beautiful view, 100 meters to the beach! Fully stocked, pans, spices, cooking utensils. Very nice home home, with beautiful oceanfront view...and Dan and Jim were great to work with. Definitely recommend! Very clean well stocked with a great view. We had a great time. Beautiful home and extremely well maintained. Plenty of room with everything needed for a pleasant stay. Thank you for the nice review. We take great pride in making our beautiful home the best place possible for your vacation and relaxation. Glad you found everything needed and had a great vacation. The view was incredible! It was the perfect setting for our wedding. It was peaceful and relaxing. Congratulations on your wedding. Thank you for the good review and hope you have many wonderful days ahead. 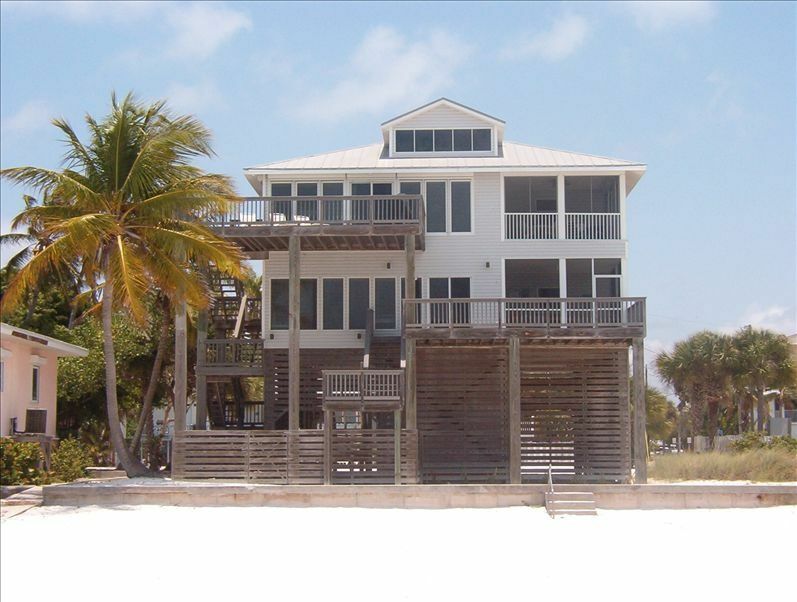 Maybe you’ll celebrate your anniversary’s at our beautiful beach house. Wonderful place on the beach! We have stayed at this house many times and have never had a bad experience. The kitchen has everything you should need and you can watch the sunsets right from the porch if you wish. We cannot wait for our next visit and cannot imagine staying anywhere else! Thank you for the wonderful review. You have been a great guest in our Florida Home for many years. We appreciate the way you respect and take care of our home. You and your family are always welcome in our home. Hope you have a great summer. After reading all the glowing reviews, I had really high expectations of this place. I can tell you that my expectations were certainly met, if not exceeded. The house was lovely. The owner Dan and the agent Jim were great to communicate and work with. Lots of love and attention was put into furnishing, decorations, and stocking all that's needed in this house. Kitchen was overflowing with quality dinnerware, gadgets, pots, pans, knives, spices, etc. Closets were FULL of high quality towels and sheets. The view cannot be beat. You step out of the door literally right onto the beach. The beach is quiet in this are, but beautiful and enjoyable. Lots of families in this area, quietly enjoying their time on the beach. Thanks to the owners and great agent for providing such a lovely place and accommodations. Thank you for the wonderful review. We take a great deal of pride in trying to meet the expectations of all our guest. We greatly appreciate the respect and care you gave our home while staying there. We hope you have a great summer and will return to our beautiful Florida home some day soon. Jet express to Key West, Big M floating Casino. The total due for the rental shall be: the rental rate, plus 11% Florida tax, plus a minimum $150.00 cleaning fee. A payment of 25% of the rental rate along with the refundable damage/security deposit of a minimum $350.00 is due on the acceptance of agreement. The balance of the rental rate, 11% Florida tax and cleaning fee must be paid in full 60 days prior to the check-in date.